How do you attract new customers to your coffee shop beyond the people that walk by or are already familiar with your shop? A good location, unique and consumer-friendly environment, an alternate product offering and of course great coffee is a good start, but considering that anyone can get coffee anywhere, is this enough? What incentives can you implement in your business to add to the mix, and what online marketing engagements should you invest in? In this blog post I will talk about one of the possible ways to answer these questions, by utilizing and engaging customers in social media. Is Social Media Right for Coffee Shops? As a small coffee shop, use of social media might not seem like a significant contributor to the success of your business. Your customers stop by your store and pick up a coffee because it’s local, convenient, social and of good quality. So why should you use social media to sell more coffee? Firstly, food services as most other industries experience a high growth of renowned brands and chain-stores that eats up independent coffee shops. Most of these larger companies win customers because of consumer familiarity to their brand through a variety of location and high advertising budgets! Secondly, you may think you have reached out to all potential local consumers, but the truth is that customers need incentives to come back and substitute their coffeemaker at home or office with better alternatives like freshly brewed in-store coffee. Competition is everywhere, and quality of product and environment alone cannot expand your consumer segment. So how can social media for coffee shops help tackle these problems? By virtually connecting everybody to a social network, there is an incredible potential for the spread of your product and brand. Engagement with clients outside your store is difficult as a coffee shop because consumers don’t have that many reasons to connect online, unless you use incentives. Just being present online is not sufficient for anyone because everyone can be. That’s why you need to implement the right tools to attract and engage customers to your network! Why not make it a social one? Interact with customers, spread ideas, advertise promotions and explain how they benefit from being connected to your network. This guide will help you utilize your social media platforms as marketing tools with the purpose of maximizing the reach of your potential customers, receiving feedback on your brand and products, and most importantly building relationships with clients outside your local store, so pay attention☺!☺! Communicating With Your Customers – Ask Questions! We will start things off by focusing on how you can engage your customers, because this is the most essential and opportunistic part of social media for businesses. There are numerous of barriers removed when it comes to people expressing feelings via online. Rather than having surveys in your coffee shop or asking around for biased opinions in store, you can initiate and facilitate conversations on Facebook and Twitter. Remember that you often need to ask the questions! If you are unsure about changing your pastries to sandwiches, why not ask first, instead of changing parts of your supply chain of goods and hope for the best? Communicating through social media is a powerful tool, and it makes your customers feel valued, and their opinions heard, evidently creating a relationship between them and your business. It’s obviously not enough to just ask questions, you need to analyze and utilize your feedback. Having a high response rate on requests and questions will have the same effect as good customer service in your store. When you post updates and promotions, pay attention to what people like and reply. You may think that you know everything about your clients, but you will be surprised to see how many new ideas and suggestions you can learn directly from just observing followers on your social media page. The best and most trustworthy stories come from the unbiased mouth of your clients, so why not employ these stories when advertising your store on your social media platforms. Create contests and promotions where consumers are incentivized to click and stay updated on your page. For a coffee shop, a photo contest with a brand related topic and prize could be a good way to market your product and brand indirectly through your consumers. Ask for the best picture of coffee froth received from your in-store barista. While engaging your customers, you simultaneously challenge your employees in a creative and fun way. What do you award the winner? An iPad? No, not because an iPad isn’t a good prize, because it has zero relation to your product. Remember that you want people back to your store, so why not give away a $100 gift card or a gift basket full of your best coffee and coffee accessories! As you start building up your social presence with promotions, reward campaigns and news updates, getting the word out passed your current followers becomes the next challenge. A primary focus should be on your email list, fans and followers. As a smaller boutique store, having one social media channel might be enough if resources are limited as it’s better to have one exhaustive and high quality company page on Facebook than two half-way attempts on Facebook and Twitter. The second stage in your online marketing plan should involve other channels past social media like optimizing your own webpage, content marketing, SEO, ads on Google, Facebook and relative webpages. A focus on your online advertising efforts is important, but it doesn’t substitute in-store efforts.Technology makes things easier and more accessible, but it cannot take away that people still have to be physically present in your store when buying your coffee. Therefore informing and advertising your Social Media promotions through in store ads and word of mouth of your employees might be just as important as a Facebook update. The danger of annoying through pressure selling is as (or possibly more) present in social media than other marketing channels. Overloading news feeds with new products is not the way to gain the right kind of attention. It’s a thin line between annoyance and appreciation, so be sure to always be on the right side, not pushing your limits. Implementing a pull strategy can help you to ensure that you are not just selling your product but you are making it compelling to buy. Through customer engagement you can see what clients are showing greater interest for. Take use of suggestions from followers and raise ideas online before you implement them. Promote various products at a lower level of frequency and when greater response is received on certain items, you know what to invest in. Your social media platform is not your store. It is therefore essential that updates and promotions are there to inform and not sell. Is the patio open for the summer? Inform with pictures and updates, and make it seem appealing to buy your new summer specials. Don’t throw sales items and promotions out in feeds as an auctioneer. Pick your updates wisely. Just like in your email inbox, nobody likes spam. Similar to when your customer walks in to your store, a Facebook user makes his opinion when he enters your page. Factors that affect the perception of the business is visual graphics, number of likes, running events and everything else that immediately catches the eye, especially company images and banners. It is therefore no reason not to optimize the appearance of your platform to match the professionalism of your business. Your current graphics should be dynamic and fit the current theme of your store. If winter is around the corner and you have new Christmas specials, your banners should portray this. Remember that images are a lot more eye catching than words, so if you want to inform, do it graphically. If you run a social offer where you give out free coffee to the 20 first participants that enter, the purpose of the promotion is not for those 20 but the buzz the offer creates. If this campaign is only visually present as a small event photo under the banner, few will notice. Make your banner represent the promotion and create an arrow down to wherever participants have to click to join. Remember that whenever you update your profile on Facebook, it comes as an update for your followers. Wishpond provides social media marketing tools (like its awesome Facebook Contest App) to help you easily create and run contests and promotions on Facebook, Twitter and websites. Regardless if you are a small business owner or a global retailer, you can benefit and run these contests successfully, either independently or with help from the Wishpond team. What ROIs can I achieve by running social contests an promotions? 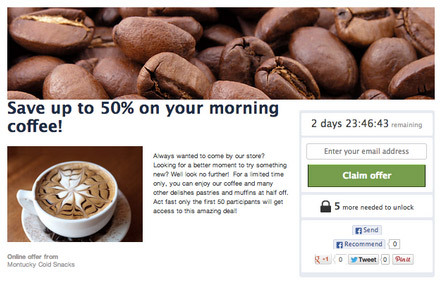 Below, we’ll focus on the following three types of contests to promote your coffee shops. For more ideas, check out 25 Creative Facebook Contest Ideas You Can Use Today. 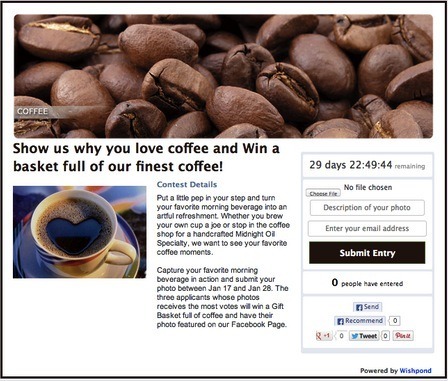 Photo contests are incredibly simple to set up on Wishpond, and yet very effective. Participants are given a photo theme, in which they have to upload a photo within that theme to your Facebook page (or social media vehicle of choice), and a winner is chosen. This encourages people to create relevant content, which spreads virally on Facebook and builds brand loyalty participants. Of course, this requires actual effort from participants, so the turnout will undoubtedly be relatively lower, but those that do will have a stronger attachment with your company. To select a winner, you can manually choose the contest winner or allow followers to vote on their favorite entry. How do I boost my photo contests? If done internally, the theme of the contest would be of one of your actual products. For example, the photo contest could revolve around who can submit the best photo showing why they love the coffee they get from your coffee shop. In theory, this would encourage people to visit your coffee shop to take the photos and build a stronger attachment between your business and the participants. However, there is a chance that some skeptics may think of the whole thing as a scam as the only way anyone can enter the contest is to buy a cup of coffee from your coffee shop. This may reduce the amount of participants. revolve around who can submit the best “I love coffee” or the best coffee craving moment photo. By doing this, the contest can still be about your business while not seeming like a cash grab. Another important tip for photo contests (and all contests, really) is to keep the prize relevant. Don’t just make it for an iPad or something unrelated because the majority of your participants will be for people who are interested in iPads and may not care about your coffee shop at all! A coupon for free coffee or significant discount are both good places to start. Vote Contests are one of the most versatile and effective contests that Wishpond has to offer. It works for virtually any industry, has very low barriers to entry, and can even empower your followers. Quite simply, participants submit their email addresses and are then allowed to vote between any number of options. Vote contests are especially powerful as they give your audience a chance to voice their opinion on a variety of topics. If you think about it, voting is practically asking you users for their opinion, so why not gather it through a Voting contest. One way to help temporarily boost demand for your business is to have a limited time (or quantity) offer. In such a competitive industry, followers are often very price sensitive and whether or not they decide to go to one business over another can wholly depend on the price of the product. How do I boost my offers? Using offers is a great way to expose your brand to people who may not have heard about your coffee shop or those who are on the fence about living their current coffee shop and trying something new. There is often a fine balance in setting up the price of the offer. If the savings do not appear high enough (5%-10%), people may not feel like it is worth the effort. However, excessively low prices may encourage a large turnout, but may not be worth going so far below margins. One way Wishpond allows you to deal with this problem is to limit the maximum number of people who can redeem the offer. This way, the low prices are still accessible to the public, but are constrained enough so that it doesn’t make a large dent in the bottom line.